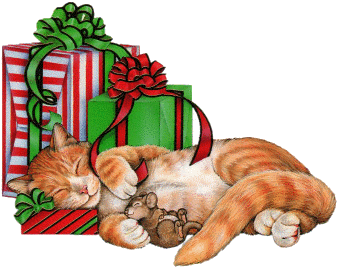 Season's Greetings From Forgotten Felines! Kamden: A former FF kitten has found his forever home thanks to all of our supporters... Purrs! for their generous financial help throughout the past year. Once again, we have been able to take in many cats and kittens into our organization, fix them up, and adopt them out to loving forever homes. Your financial support let us spay/neuter an even greater number through our TNR program, preventing unwanted feral kittens being born into a hopeless life. Your compassion has let us meet the ever increasing need of helping homeless kitties and hope you will continue your generous support in the coming year. There are so many more waiting for our help! Together we are making a difference, especially to those kitties like our cover kitten, Kamden, going on to forever homes and saved from the cruelty of homelessness. 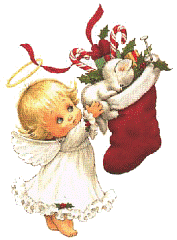 Please spread the joy of the season by giving them a loving forever home! 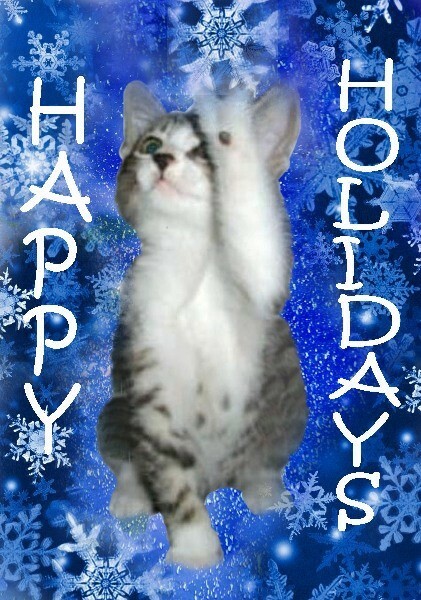 They can be seen at http://forgottenfelinesny.org ... Holiday Purrs!!! Be sure to check out the Kitty Help link under Helpful Links on our website for very useful information including low cost spay-neuter clinics, behavior problem solving, feral and stray kitten-cat help, rehoming your kitty, pet food pantries, finding your lost pet tips, adopting - introducing your new kitty, and more. While you're there, please visit our Happy Tales page for stories that will warm your heart. Our email address is ForgottenFelinesNY@gmail.com. Online Shoppers! 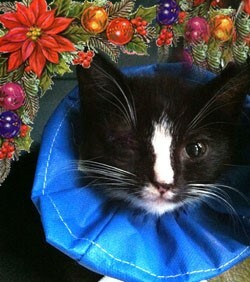 Please do your holiday shopping thru iGive.com or AmazonSmile with Forgotten Felines Inc, Valhalla NY as your charity. No cost to you but our kitties get $ every time you do! Info on our website. Purrs! Microchipping will save you and your kitty a lot of heartache if your indoor kitty accidentally gets outside. See our spay-neuter clinics on the Forgotten Felines Links page - many of them also do microchipping at a discount. Reminder: Cold season is here and cats seek shelter in cars! Do not forget to give a few taps on the hood before starting your car! Kip, a beautiful black/white tuxedo kitten, was only weeks old when she was saved after her mom dropped her off a 4' wall. When this kind person went to check out the tiny kitten and saw that she had a bad eye infection, she rushed her to her vet's office where she was given antibiotics. But Kip's eye infection was too severe, so much so that her eye was nearly bulging out of its socket, that the antibiotics weren't working. She then contacted FF and a dedicated volunteer took her into her home and provided Kip with the necessary medical care. Unfortunately, Kip's eye had to be sacrificed to save her life. Now Kip is a loving, energetic kitten, enjoying her life that was almost cut off too soon. She is thriving and happy in a wonderful forever home. We need to be ready for the next little one needing our help. We can't express enough how appreciative we are of all the help you have given our kitties over the past year! PURRS! 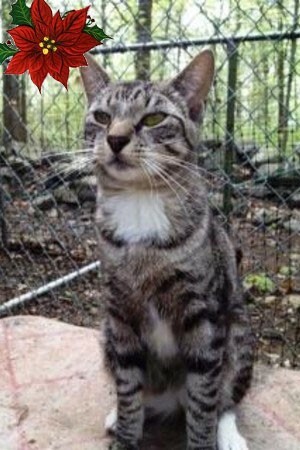 TIMMIE is a sweet, lovable, 1 1/2 year old boy who is looking for a family of his very own. Santa, being so busy and all, forgot about him last year and he so much hopes it doesn't happen again this year! Timmie and his littermates were saved from euthanasia with only hours to spare by caring people who knew how precious these kittens were even though they tested positive for the FIV virus. His siblings soon turned negative and were adopted, leaving Timmie behind and wondering, "Why Not Me? " Timmie never turned negative but he is perfectly healthy and should live a healthy, happy and long life. FIV is not HIV and all it means is that his immune system is somewhat compromised and therefore he may be more sensitive to colds, infections, etc. With prompt treatment, he should be fine again. Actually, Timmie has never been sick at all. FIV is not contagious to people or dogs- only to cats through a deep bite wound. He can be with other cats as long as he is introduced properly and there is no fighting. You can read more about FIV HERE. Timmie is neutered, micro-chipped, feline leukemia negative and all set to go to spend the holidays with you and forever. If interested in adopting this really great fella, please check out Timmie on PetFinder! Copyright © 2014 Forgotten Felines, All rights reserved.